More 'grolar' bears spotted in N.W.T. The 'grolar' bear - a mix between a grizzly and a polar bear - has been spotted once again near Ulukhaktok, N.W.T. The 'grolar' bear – a mix between a grizzly and a polar bear – has been spotted once again near Ulukhaktok, N.W.T. The sightings are becoming more common – the last one was shot near the community in 2010, and another was found in 2006. Robert Kuptana, who lives in the Arctic hamlet of about 400 people, said a family of three bears was recently hunted by someone in the community. "One is pure white, which is the mother, and there’s one with fairly dark fur on it and another one, too, is fairly white but you look at the legs and they’re brown, so it’s a very different being," said Kuptana. Kuptana said grizzly bears, which are a species not natural to the area, are increasing in numbers near Ulukhaktok. He said ever since the caribou have been travelling a different route along the mainland, the grizzlies have been following the herds and mating with polar bears. 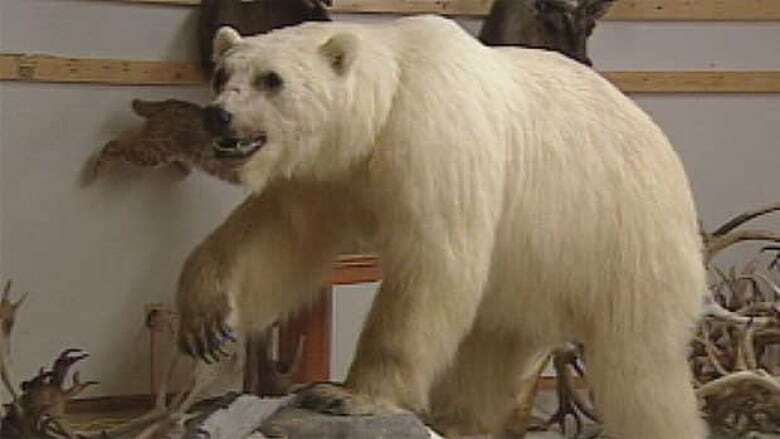 Unique 'grolar bear' to be shipped from N.W.T.